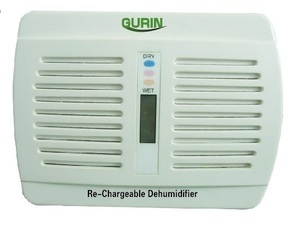 This high capacity renewable dehumidifier has been designed to adsorb moisture from small, enclosed areas. It will help protect clothes and valuables from the damaging effects of mold/mildew and moisture rot. It is 100% renewable and needs no power to operate. Just hang the Gurin unit in a closet, or you can place it in other small, enclosed spaces, and it will start to adsorb moisture. There are no batteries required or cords to plug in, the unit works without power. There is an indicator window with special “moisture meter crystals” that change from blue (when dry) to pink (when wet) to indicate when the unit needs to be “renewed”. The unit will adsorb approximately 8-10 ounces of moisture (depending on humidity levels this should take between 6 – 8 weeks). Once the moisture has been adsorbed it cannot leak or spill. This unit uses a specialized, engineered, crystallized silica gel that is odorless, non-toxic and completely safe. When the indicator crystals turn pink it is time to “re-new” the unit. Simply remove the unit from where it is adsorbing moisture and plug it into a power outlet or power strip in a well ventilated area (bathroom with extraction fan, garage, outside, etc.). There is a built-in heater that will warm the crystals allowing them to expand and release the moisture as water vapor into the outside air. It takes about 12-14 hours to completely re-new the unit. When it is completely renewed the indicator crystals will change back to blue. The unit is brand new again and ready to adsorb another 8-10 ounces of moisture. The crystals will remain active for 10 years and we offer a 5 year limited manufactures warranty on all of our DHMD-110 units.